Capt. Nathaniel Lemmon is a full-time, professional guide and tournament angler in Florida. He doesn’t work for anyone or work any other part time jobs...this is his life. He spends every possible day on the water fishing, scouting, product testing, or guiding. This amounts to an annual average of over 250 days fishing the Mosquito Lagoon, Indian River Lagoon, New Smyrna Beach, and Daytona Beach area. He’s an accomplished angler that has been featured through fishing articles in newspapers, multiple magazines, and television. He also annually competes with top redfish pro’s from around the country at redfish tournaments. 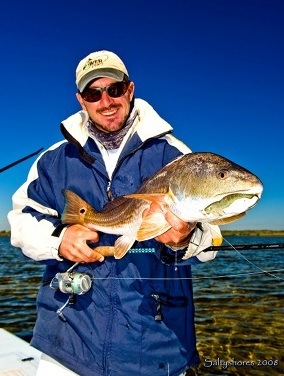 He has won several redfish tournaments and has numerous tournament finishes in the top 5. Capt. Lemmon does not do "cookie cutter" fishing charters in the Mosquito Lagoon, Indian River Lagoon, or around the New Smyrna Beach area. Your guided fishing charter is custom to your needs, wants, goals, or ability. This means YOU fish for what YOU want to catch...not what some fishing guide tells you you're going to fish for. He doesn't do fishing charters out of the same old ramp everyday and fish the same old spots. He runs fishing charters in an area from Daytona Beach to Cocoa Beach (nearly 75 square miles) and has many different boat ramps that can put you close to the best fishing action. See an aerial map of the Lagoons. That means you aren't going for hour long boat rides to get to the best fishing charter action. Your Mosquito Lagoon, Indian River Lagoon, and New Smyrna Beach fishing charter is all inclusive! All rods, reels, lures, live bait is provided on your fishing trip at no extra charge. You don’t even need a Florida fishing license to fish, Capt. Nathaniel provides that for you. A cooler is on board for your convenience. The only things you need to bring on your fishing charter is any food or drink that you want for the day and a pair or polarized sunglasses (recommended). Fishing Charter Rates are honest, fair, and comparable, and he gives you a satisfaction guarantee. And after you enjoy your fishing trip, please share a testimonial with Nathaniel for others to read. Capt. Nathaniel Lemmon is an expert at lure fishing, fly fishing and live bait fishing. He fishes with and instructs more advanced anglers how to use lures like spoons, soft plastics, jigs, plugs, and swim baits. A fly angler himself, Capt. Nate will teach and offer advice on casting technique, how to build leaders, tie knots, and provide you with a wide selection of flies he ties himself. For those that prefer to use live bait, you're in good hands. Capt. Lemmon catches and traps most of his own bait. He specializes in fishing pigfish, croakers, live mullet and shrimp. Each fishing charter is also adapted to your particular skill level. The waters around New Smyrna Beach and Daytona Beach are one of the top 5 fishing charter destinations in Florida! Saltwater fishing charters with Capt. Nathaniel are only 5 minutes from New Smyrna Beach, 20 minutes from Daytona Beach area resorts, 45 minutes from Palm Coast area resorts, 45 minutes from Orlando International Airport, or 1 hour from all Disney attractions. There’s no slow fishing months in the Mosquito Lagoon, Indian River Lagoon or New Smyrna Beach area. The waters around here are regularly featured on television. The Mosquito Lagoon and Indian River Lagoon are featured at least once a year in practically every major fishing magazine on news stands and host multiple professional redfish tournaments. Over 500,000 people a year travel to the Mosquito Lagoon and Indian River Lagoon for fishing charters and recreational fishing. Fishing Mosquito Lagoon (all within Merritt Island National Wildlife Refuge or Canaveral National Seashore) is a unique experience. You’ll see Florida unspoiled and free of development; the same way it was hundreds of years ago when Spanish explorers laid eyes upon the Mosquito Lagoon for the first time. Mosquito Lagoon is a world famous fishing charter destination and generally mentioned in the same breath as the Florida Keys. In addition to the hundreds of fish you will see while we fish in the Lagoon, every day you’re guaranteed to see bottle nose dolphin, manatees, ospreys, pelicans, herons, egrets, stingrays, and horseshoe crabs. On most fishing charters in the Mosquito Lagoon we also see alligators, raccoons, and bald eagles all the while listening to the ocean surf on the other side of the Lagoon sand dunes. The crystal clear fishing waters are some the best sightfishing opportunities found in Florida or the world. Capt. Nathaniel Lemmon is an expert at targeting saltwater grand slams on the Mosquito Lagoon, Indian River Lagoon, and around the New Smyrna Beach area. He has worked hard to find opportunities here to catch redfish, spotted sea trout, snook and tarpon nearly every day of the year, even during the winter cold. The IGFA recognizes a East Coast Florida grand slam as a legal catch of a redfish, spotted sea trout, and a tarpon in one day. You also have the opportunity to complete a West Coast Florida grand slam here on our waters (redfish, snook, and tarpon). Capt. Lemmon will be happy to complete the paperwork and sign as your witness to the accomplishment.